NEW YORK -- Nathan's Famous may be in the hot dog business, but for decades they've been peddling a whopper. As the story goes, an Irish immigrant named James Mullen had been walking in Coney Island when he challenged a group of recent immigrants to prove who was the most American. 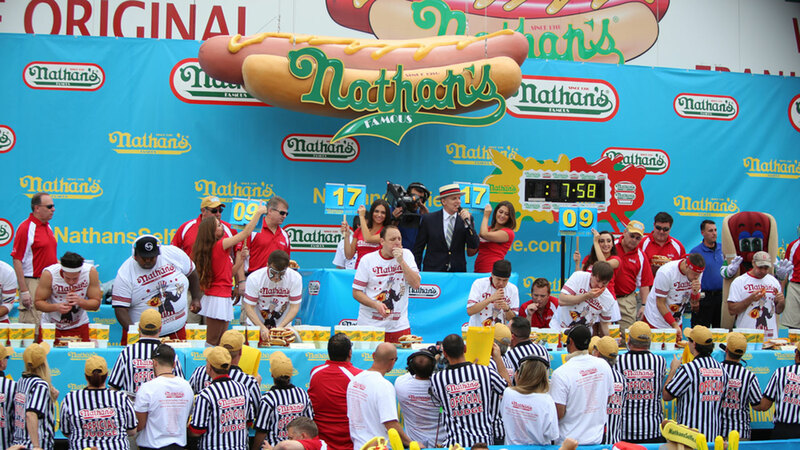 Of course, they decided to settle it by eating hot dogs. It was a tale repeated over the years in stories by numerous news organizations, including The Associated Press. Organizers held their annual weigh-in for the contest Friday in Brooklyn. The event featured a stare-down between Chestnut and the defending men's champion, Matt "The Megatoad" Stonie, as well as between defending women's champion Miki Sudo and three-time champion Sonya "The Black Widow" Thomas.